Alright, here’s the how-to I promised you last week. 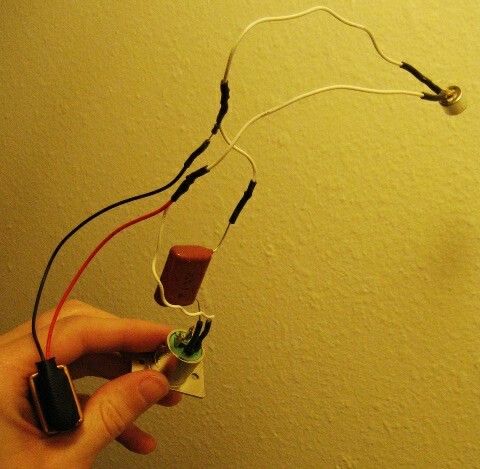 Hope it helps any of you who might be trying to make a microphone like the one I made! You can get all of these parts on DigiKey. You will also need a soldering iron and some solder. Note that though I used a Zhena’s Gypsy Tea tin for my project, you might do better to use something else. 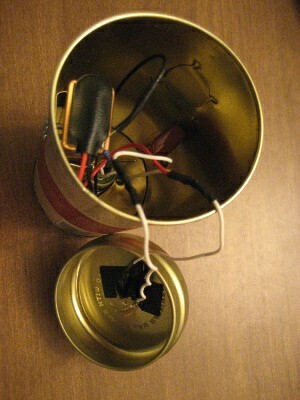 I had trouble with the tea tin altering the sound of the microphone, making it sound really cheap. I mitigated some of this by stuffing the tin full of cloth, but the best solution would have been to either allow the lid to flip up so the sound never enters the tin itself or to simply use a different case. Solder the disc capacitor between the mic cartridge leads. Be careful doing this as excessive heat can damage the cartridge. Solder together pin 1 and the ground pin on the XLR plug. Solder the 10.0UF capacitor to pin 2 and, to pin 3, a wire long enough to reach from the XLR plug to the mic cartridge when you put the whole assembly in its case. Add heatshrink tubing as you go, if you’ve opted to use it. Now let’s put it all together! 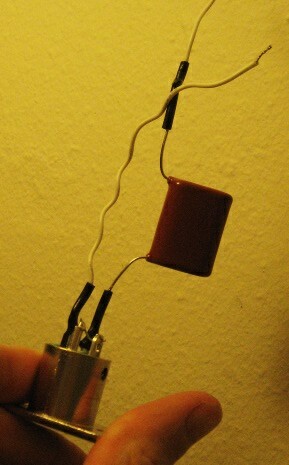 Solder the positive lead (in this photo, the red wire) from the 9V battery snaps to the wire coming from XLR pin 3. Solder the negative lead to the wire coming from XLR pin 2. 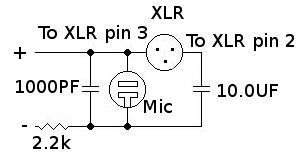 Solder wires onto the mic cartridge if you find you need more distance between the XLR plug and the cartridge, and then solder the negative lead from the cartridge (the one with extra solder/connections running from it) to the wire coming from XLR pin 2. Solder the other lead to the wire coming from XLR pin 3. You could use the microphone now, if you like. In fact, you probably should, just to make sure that you soldered everything together right before you go putting it in a case. Everything from here on out is up to you and depends entirely on the sort of case you decide to use. Here is what I did, though. Consider the remaining steps optional. 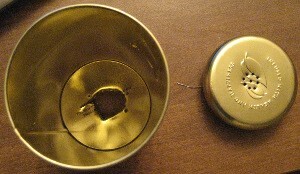 Carve out a few holes in your tea tin. You’ll need three on the bottom (one for the XLR plug to fit through, two for the screws to hold it in), several on the top to allow sound in, and two on the side for the screws for the battery holder. I used a box cutter and a twisting, drilling motion for this, though I would recommend a dremel or something of the sort if you have access to one. As you can see in this photo, I slipped a bit with the box-cutter while cutting out the XLR hole, which led to a bit of trouble in actual use with the action of connecting and disconnecting the mic breaking the thin bit of metal left around one of the screws. Pull the whole assembly through the XLR hole and fasten it to the case. I used screws scavenged from old video cards, as these came with nuts and were small enough to fit through both the XLR holes and the battery holder holes. I also used a bit of electrical tape to hold the microphone cartridge up against the lid of the tea tin. And there you have it! A detailed, step-by-step explanation of how I made my condenser mic, as promised. Hope it was somewhat illuminating. Tune in Friday for my usual fare. I wish I had the skills to do this. Very cool blog! What did you connect it to for the recording? Sounds great! I have a digital recording station thing, and I know I can use an XLR plug into that for mic input, but I usually use a tape recorder when I’m not at home, but it has difficulty pickup up from my amp when playing with a drummer, even when its positioned very close. If I use a converter to plug the condenser mic into the tape recorder, do you think that would work better? I had it plugged into an RME Fireface 800 which was in turn plugged into a laptop running Cubase 5. Um… I’m not sure I entirely understand all you’ve just said, but I imagine if you’re plugging a condenser mic into your tape recorder you might be having problems because the tape recorder isn’t supplying the condenser mic with the 48v of phantom power it might need. Oh, okay. Yeah, if you’re recording guitar with drums and having trouble with the drums overpowering the guitar, you might want to consider recording the drums separately and then mixing the guitar in later. Sorry, I thought your mic was just really quiet or something. It sounds like your changes should work. I’m not familiar with the cartridge you’ve chosen, at least not off the top of my head, but I’m guessing it’s equivalent to what I used. As for using an electrolytic cap, I understand that those yield a colder sound with a bit harsher distortion. I haven’t had a chance to try them out myself yet, though. so any catrigde can do the same job?thanks for your help.i saw on the original that the 10.0uF should not be replaced by an electrolytic cap. I’m not an expert on cartridges, so I couldn’t say for sure. However, any cartridge with similar specs to the one I used should be fine. At worst your microphone might be a little quiet compared to mine, or you might end up with distortion. I was able to swap out the cart in the original spec for a generic Radio Shack cart, though, and that ended up sounding better than the original, so you’ll probably be fine with most cartridges. 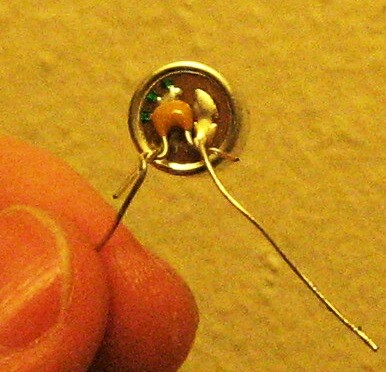 Do I need to solder pin 1 to pin 2??? If not, which pins i must to solder?? ?